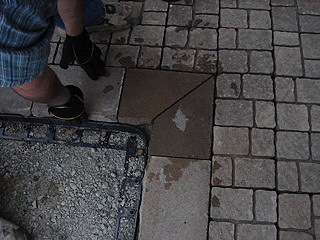 The day started out with Gino renting a stone cutter (that’s probably not the technical term) to trim down some of the paver’s around the edges. He wanted to get all this trim cutting work done before leaving for vacation in a few days. It worked out really well! 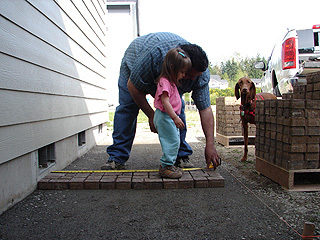 Making sure the paver’s fit just right around the step. The edge close to the garage wall looks really nice. 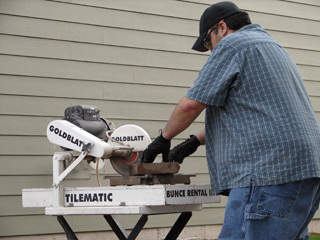 Using the masonry saw (technical name) and making sure we measure twice and cut once. Look at that cut. Perfect! 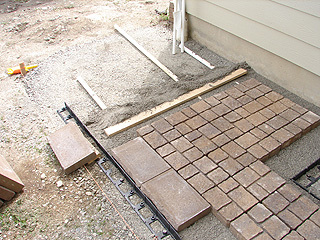 The area were the step will be, he is going to work on later (after vacation). 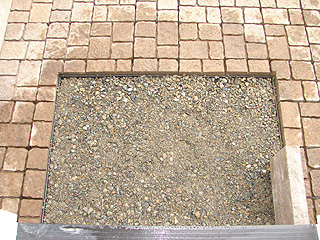 The step area with some added leftover gravel/sand mix. 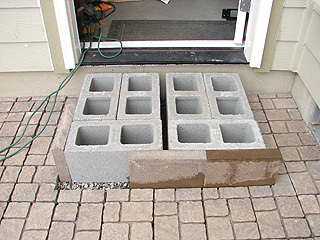 Which Gino later took out because it raised the block and paver’s up to high to the door. 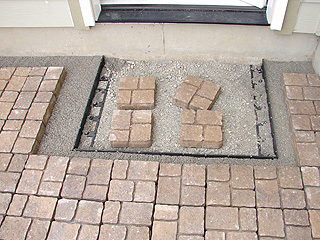 Finished paver walkway. It looks so good! 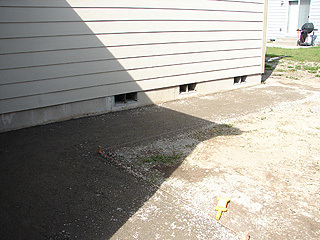 Finished corner (besides the step). 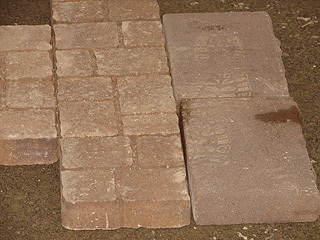 Sneak peak at the what the step will be made of. 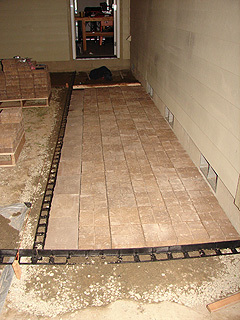 Cement will fill the the holes of the concrete blocks and brick morter will hold the pavers down onto the step. When the project is complete I’ll take more photos. Well, it’s coming along. How does it look? 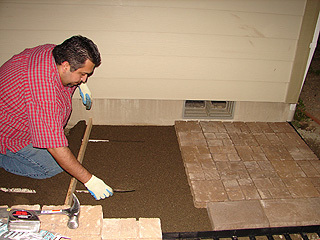 Gino has been going out in the evening and working hard on our pathway. He’s doing a really good job! It looks awesome! 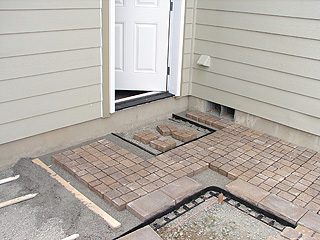 Pathway to backyard. 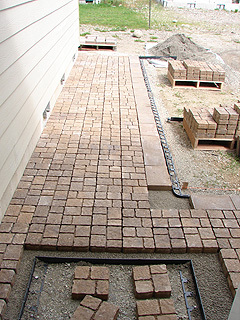 The area beyond that (on the right upper hand side) will also have a pathway as well leading to our back patio slab. 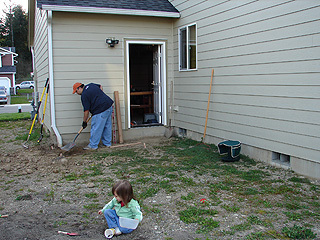 Where the pallets are located (in the foreground) that area of yard will be grass for Isabel to play in. 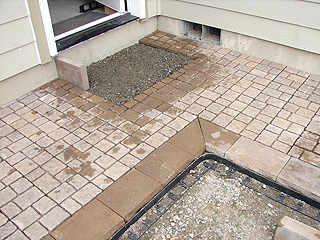 This “hole” will be for a step. 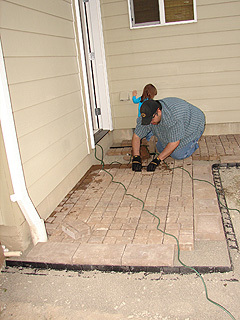 The other “hole” areas will be filled with pavers that Gino will have to cut. Gino will finish this off out to the corner of the garage. 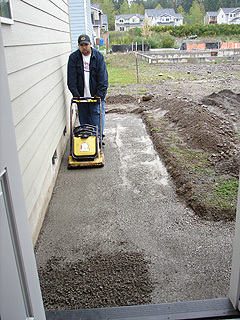 Again after dinner, Gino heads out to work on the pathway. 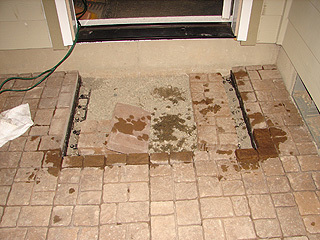 Beginning the layer of pavers with a base of sand. 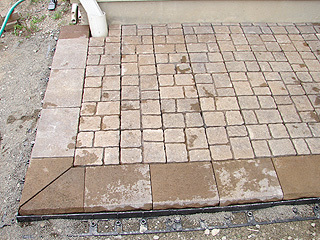 Close up of pavers and boarder. 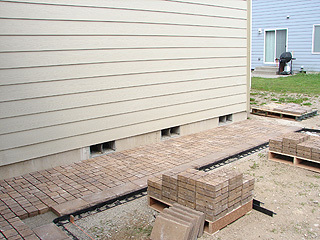 A couple rows of the completed pavers and boarder. 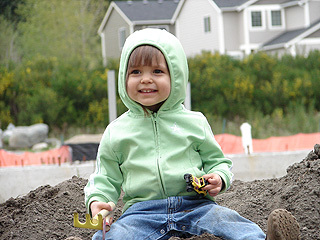 Isabel and I headed to church that morning while Gino stayed home to finish up using the compactor; that needed to be returned to the rental place by 1:30 pm. 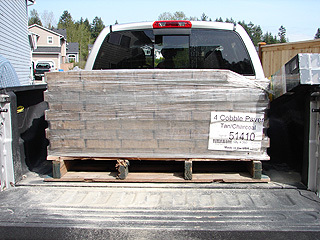 After we returned home from church and returned the compactor, we headed over to Lowe’s and purchased 250 pavers. 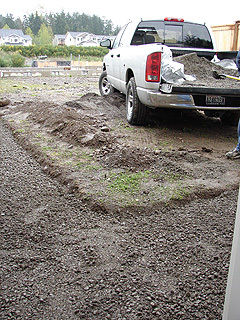 Unfortunetly, we didn’t make it back over to the landscape place to get a load of sand. Which was alright, Gino picked that up on his way home from work the next day. 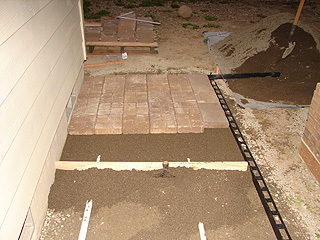 3 layers of gravel/sand mix compacted to 6 inches. 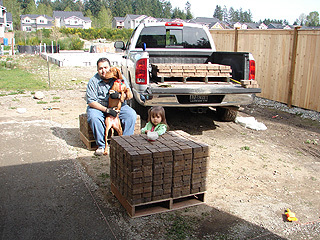 Break time from unloading pavers. Checking on wideth, “feel”, and look. We decided to add a matching border which will be placed along the outside edge about where Gino’s hand is. 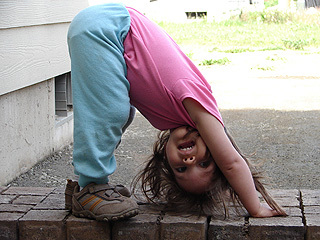 Isabel just goofing around on the pavers! The day was a bit of a disappointment, but that’s the weather in the Pacific Northwest! 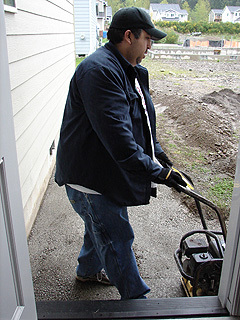 Gino ended up working outside by himself in the pouring rain. 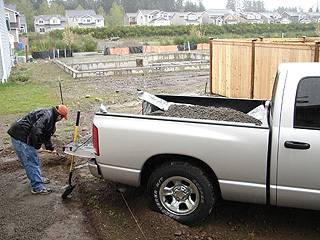 We purchased 3 truck loads of a gravel/sand mix and then rented a compactor to compress the mix between the 3 loads. Load 1 of gravel/sand mix. 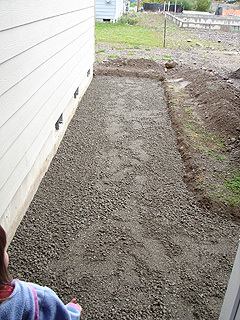 Gravel/sand mix before being compacted. 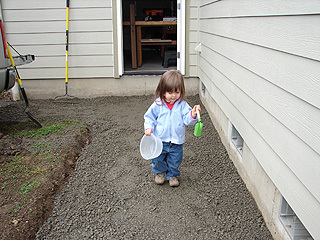 There was a slight break in the rain so Isabel is helping daddy “compact” gravel/sand mix. 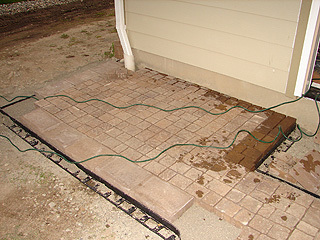 Works so good it looks like concrete! Load 2 of gravel/sand mix. Both loads of gravel/sand mix compacted and complete. 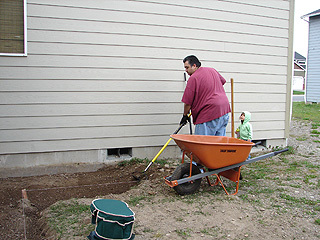 Gino went out after dinner and began the back breaking job of digging out all the rock to make a nice sloped level base. 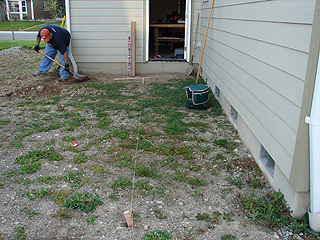 He dug 6 inches down and 4 feet away from the house and 30 feet long of pathway. He didn’t get finished this first night. Since it’s a work day, Gino again headed out after dinner. 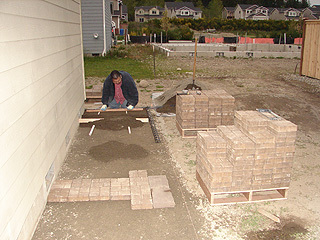 He actually got all the foundation digging finished this night of the paver project. 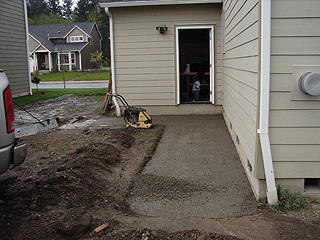 Rounded the corner and working toward the back corner of the house. Isabel just loves playing out here and getting dirty! It was very chilly this day with a breeze, so I made her wear a hood. She didn’t mind and it kept her hair outta her face too. 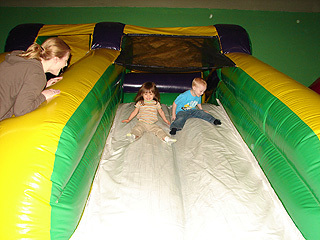 Thankfully, Marica went up the slides with Isabel. 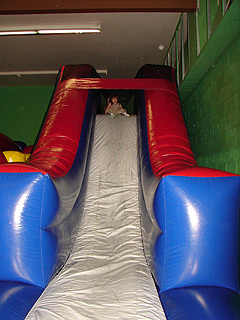 Later, Isabel was going up the smaller slide all by herself! 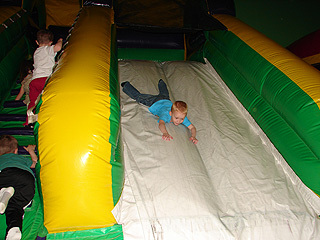 Jaden going down the smaller slide on his tummy. 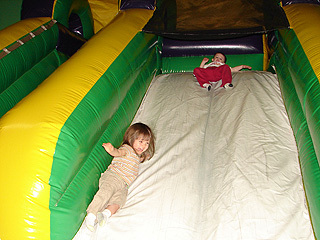 Isabel going down the smaller slide on her side. She was all smiles the whole time we were there! She had so much fun! 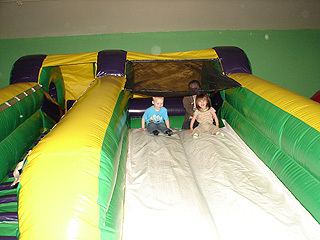 Jaden and Isabel going down the smaller slide together. she was laughing and smiling all the way! 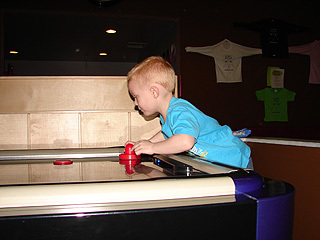 Thanks to Marica and Jaden for inviting us; We had a blast! Let’s do it again soon!